James Harden, guard for the Houston Rockets, is on an incredible scoring spree having his 30 point streak now at 16 games, tying Kobe Bryant for the longest streak since the NBA/ABA merger. 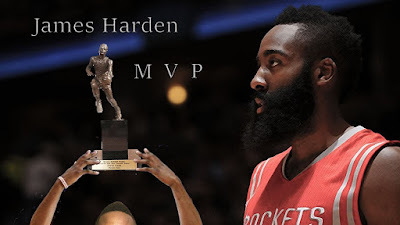 The reigning MVP is doing all he can to repeat his most valuable title as he is leading the NBA in scoring averaging 34.1 points per game blowing away his closest competitor by more than 5 points per game. Harden also is number 5 in assists. For best viewing-play in full screen...and uh, for best listening, turn down the volume. Remember Rockets' fans....it's the thought that counts! You're a brave man, Michael, and a mensch!